Whenever my brother or I walk in a mall and we smell buttery-cinnamon, all good intentions go out the window and we immediately follow the scent to the nearest Cinnabon. And we don’t only buy one Cinnabon each, we buy a few. Way too many to actually consume in one sitting, but the way they are lined up, all glistening, sugary and rich just makes us swoon. 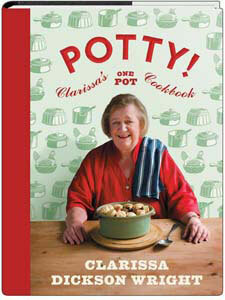 And not only am I giving you a recipe for Easy Cinnamon Buns, I’m also giving you the chance of winning a copy of “Potty : Clarissa’s ONE POT Cookbook” by Clarissa Dickson Wright. Clarissa is best known as one half of the fabulous “Two Fat Ladies” along with Jennifer Paterson who sadly passed away mid-way through their fourth season in 1999. This book is filled with fabulous one-pot dinners and unlike most other cookbooks, are very budget friendly. Recipes like Bacon & Egg in a mug, Chicken in Coconut Milk and Lamb curry all look delicious, comforting and filling. And I wouldn’t expect anything else from Clarissa. To stand a chance of winning this fabulous book, comment on this post and tell me which food challenges you will be setting yourself for this year. I’d also like to know when you would like to have done this challenge by. The person that I feel is setting themselves the biggest challenge will win the book. Only residents of RSA need enter. The competition ends Tuesday, 25 January 2011 and the winner will be announced Wednesday, 26 January 2011. Roll the puff pastry out only slightly thinner than it already is. Spread the softened butter over the pastry and sprinkle over the caster sugar and cinnamon. Roll the pastry up into a long sausage and slice into 3-4cm slices. Line a baking sheet with baking paper and spray with non-stick spray. Bake for 15-20 minutes until the pastry is golden and flaky. Combine the icing sugar and water and drizzle over the cinnamon buns as soon as they come out of the oven. I’m so glad you liked them Mia! For this weekend’s “From Scratch” meal, it was my turn so I made pizza, but from scratch! The dough was the time-consuming part but it was unbelievably good. I worried about it but it was light and crisped nicely in the oven, with the edges of the pizzas puffing to just the right amount. The tomato base was quite easy, I followed a recipe for napolitana pasta sauce and it worked out. I marinaded some chicken breasts which I had cubed then also put together some mushrooms. I grated some mozzarella and baked at 200deg for about 15 minutes and the pizza was the best we’ve had for ages! My challenge for the year is to lose 15 kilos by June 2011. The challenge is to do this while still enjoying cooking and blogging about it. This would mean trying to combine healthy eating with still preparing something bloggable. Fish and salads instead of cream and lamb. My food challenge for this year consist of croissants from scratch, Parisian macarons (not the American coconut macaroons), lobster tail pastries (Italian – a dessert as seen on Cake Boss the TV show, and are layered like croissants but more flaky looking and filled with Italian cream). So really, I’m promoting myself into a higher difficulty and more time consuming level of baking. I’ll likely continue on my journey of finding the perfect red velvet cake recipe. I simple love red velvet, and I’ve good a good recipe, but it could use a few tweaks here and there. I began searching for the perfect recipe just before summer began – it’s been a long road, but I’ll carry it out through 2011. I’d like to attempt the pastries by the time of mid-February, or just before. It seems like it should be enough time to build up the courage and clear the time. Not to mention all the desserts that have been requested for me to make asap (like the crème brulee that I’m making in the coming week or so). For the red velvet cake…I want to finish that at least before next summer. It’s a hard thing, finding the perfect recipe that everyone loves. I want to go into detail with the cake – to be sure I’ve done everything possible to make it the best I could. To be honest, I just really just like the taste of the first red velvet cake I’ve ever tries – and that’s a cupcake from Sprinkles Cupcake Bakery. This sounds terrific – I did a version of these using frozen bread dough at Christmas and it was great- can’t wait to give your version a try. although, I would probably much rather ‘dress’ the cinnabons with a nice frosting of cream cheese, butter, icing sugar… and a squeeze of lemon. 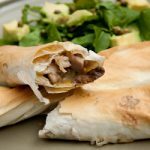 Frozen Puff Pastry has been a lifesaver in my house for many unexpected visitors – for both sweet & savory treats. I am a great fan of it! (I make an Apple Strudel with it as well – plus I recently saw that one can now also buy frozen shortcrust pastry). Idea: layer baked squares of shortcrust pastry and thick homemade custard and top with water/icing sugar/lemon dressing like yours above! Ok, after long and deep thought about my food goals for 2011. After being hit with a fly swab to smitherenes, I will have to work at reincarnating myself into an ant…I hope I will be there by christmas time! Matthew I love your challenge with your wife! Thank you, Thank you, Thank you for such an easy recipe for cinnamon buns – the one on Pioneer woman was way to difficult for me. I used to watch 2 fat ladies with my late gran – so this book brought back great memories! Oh and I also wanted to say thank you so much for recommending Nigellas Kitchen – my hubby got it for me for christmas from Yuppie Chef and it is awesome just like you said. And Ally, if these comments win the book, please donate it on my behalf to the Cancer Association or any charity of your choice. Try a new recipe each week for Meatless Monday until we find enough favourites to be able to rotate with an odd new recipe so we don’t get bored. Replace some of our treats (biscuits,cake,etc) with fruit /yoghurt – can’t replace all as we would never keep that up. Try all those recipes I have marked in cookbooks which I can’t resist buying and haven’t got to trying yet! And the one I really need to make time to do but have been wanting to do for a long time, is to take photos of my family making and enjoying their favourite dishes and then make a family recipe scrapbook with all our family favourites and make copies and give to all the family members. All the other challenges are ongoing, but I want to make the scrapbook by November as it is my fathers 70th birthday and the whole family will get together and I want to surprise everyone with them then. I love cooking and my goal this year is to start a cooking blog where my recipes can be shared with all my friends and also help others enjoy making food as much as I do. I am always looking for new recipes and trying them out. My food challenge for this year is learning to cook! I would like to make some progress by May, although I know you never stop learning but I have never cooked in my life. I’m getting married in December this year so I would like to cook my hubby to be delicious meals when the time comes and also be able to teach him how to cook too. So far I have made ‘Butter Chicken, Mince Curry, Tandori chicken with potato wedges and green salad. The butter chicken was by far the best! I’ll be moving on to the cakes next and will try this recipes this weekend, looks nice and easy to make! My new goal this year is to take a photograph of the final product I plate up for dinner every single day and to post the result with the recipe. I intend to prepare more home-cooked meals this year rather that picking up take-aways or pre-prepared meals on the way home from work. I have put on 4kgs over the festive time & my goal is to prepare healthy meals, using cold pressed olive oil & eliminating all fuzzy drinks & juices except for water. I plan to grill most of our meals & to avoid fatty foods! i will definately eliminate sugar. I want the new lifestyle to kick into place immediately & by mid February we will be on our routine to a healthy lifestyle! I will also incease our white meat intake & cut down on red meat. I am trying hard to keep to 5 portions of fruit & veg daily. No carbs after 5pm & it’s working!! I have been inspired by the movie Julie & Julia, and am searching for a cookbook that i can also attempt to cook over a period (YES each and every single recipe) and then also blog about my struggles, joy, tears and laughter! Will keep you posted, and hopefully start a followers group! I got married in December, and since this is now 2011 my wife and I agree that cooking in the evenings is a shared responsibility! Luckily, we both like to cook so there’s no argument here! We’ve set ourselves a number of weekly challenges, and every month the overall winner of each challenge gets to have a lavish meal of his/her choice cooked by the runner up! The first challenge is the budget meal. The rules are simple: a two-course meal (starter and main or main and dessert) must be prepared, for as little money as possible. The meal needs to be balanced and nutritious and properly cooked – no 2-minute noodles allowed! It must have protein, starch and cooked veg or salad. Till slips are kept to establish the monthly winner, although items used which are in the cupboard already will be added (except condiments and consumables like olive oil). The second weekly challenge is the one-pot dinner. A varied dinner is prepared, but only one pot or dish is allowed to prepare it. I have the head-start here because I make a famous chicken stir fry with new potatoes and peas in a wok, but that will only see me through the first week so I’ll have to expand my repertoire! The third weekly challenge is the “Something New” dinner. The field of selection is wide open here, because the rule is that dinner must be made with ingredients or a style of cooking that we never would have thought of ordinarily. I’m planning a snoek pie for next week, I’ll let you know how it goes! The fourth and final weekly challenge is the “From Scratch” challenge. This is always on Sundays, because as the name suggests, everything must be produced from scratch! Nothing tinned or pre-produced is allowed, including bread. This one is most fun and time-consuming, and makes for a great time and great conversation! Of course there is no end date for these challenges, but we decide the winner of the “Economy” challenge monthly, and there is plenty of discussion about the winner of the others! They have so far been successful in preventing “dinner boredom” and ensures that we eat right, and explore new foods and cooking types. We’re loving it! The challenge I have set myself this year is to create and use easy, healthy recipes to feed my family this year: from the teen girl (always wanting to look good); the twenty something son (trying to build muscle and not add fat); my fourty something husband and I (trying very, very hard to trim down). My challenge this year will be learning how to cook for just myself and grand daughter after having had to cook for 11 people last year. My resolutione is to spend more time with my children and grand daughter and the best way to do this is to invite them over for a meal over the weekend. My cooking challenge will be to suprise them everytime with a new recipe or something different and which will make them tell everyone what a marvelous cook I am!!!!!!!!!! Challenges for the year? Well lets see…I am absolutely in love with Indian cuisine and have set out to perfect the fine art of Indian dishes (got my Indian delights recipe book and all!) In my opinion, one of the ultimate tests and chalenges will be preparing food for a group of my Indian friends next month…so really holding thumbs that my biryani, butter paneer and naan will hit the spot- else EPIC failure will be imminent 🙂 Those Indain aunties are a real tough bunch to please ! On a less exotic note, being completely inspired by the Julie and Julia movie last year, I set out to perchance a copy of Julia Child’s Mastering the Art of French Cooking cookbook and have slowly (emphasis on slowly) started to work my way through it (sadly no deadlines have been set for this target since I would have to be absolutely crazy to attempt a mammoth task like that in one year- no offence to the wonderful Julie Powell ). I must confess I jumped directly to the Boeuf bourguignon as I just had to try that after watching the movie! My husband and I have just recently planted an herb garden and will be expanding it into a vegetable garden in the next few weekends, depending upon when our baby decides to make her appearance. We have successfully made basil pesto from our garden and I am now on the hunt for a good pasta maker. My quest is to make grow and make fresh lasagna, spaghetti, and all sort of dishes from scratch. Trying the cinnamon buns this weekend for sure. Have to quench these sweet cravings! We just got a slower cooker for X-Mas so I would love this cookbook as well. 3 months of maternity leave will hopefully give me a little time to cook. I am a dietician and food lover. I adore delicious and interesting meals with different flavours, textures, colours and aromas. 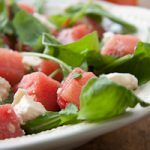 My biggest challenge is trying to achieve all of this while still trying to keep the meals healthy as well as low in kilojoules, saturated fat, sugar and cholesterol for my clients. For me, weight-loss and healthy eating has to be interesting and delicious in order for it to be enjoyable and therefore sustainable. My goal this year is to develop recipes which are practical as well as mouth watering so that I can help my clients to decrease their risks for chronic diseases of lifestyle and lose weight without them feeling like they are prisioners of a diet. I enjoy making a mess in the kitchen (and to entertain) – by “mess” I don’t mean dirty! I mean having fun (all about the experience), experimenting with aromas, textures, colours and taste. To me, if a meal looks good, you have already enjoyed about 50% of that dish – by just teasing your sense of smell and sight. So, a (personal) goal for this year is to find good balance in my cooking – without having to dish up using any culinary arts tactics. By this I mean food with full-on flavours, scrumptious textures, eye-boggling colours and blissful tastes, compared with lip-smacking (yet complimentary to the meal) drinks, etc. Now, I know Google can help out with this, but that’s not the solution… I have a creative mind of my own, so if I download a seemingly delicious recipe I will try it out and also try to improvise when cooking (call it, exquisite budgetary cooking, if you like – me being a bachelor)… A next level would be to “theme” my cooking, for each month a different nation/ culture’s cooking – i.e. April could be Moroccan-styled cooking and entertaining (now, it might sound expensive, but there certainly are ways to keep it below a simple budget). 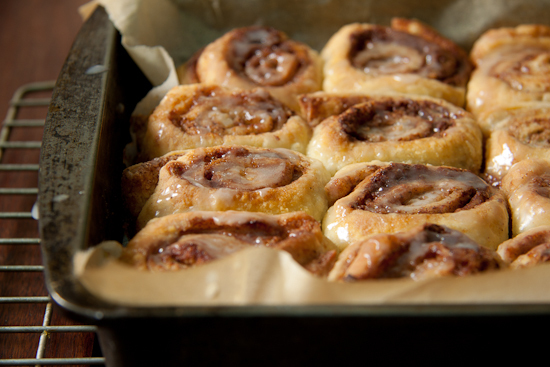 Ally was so hoping you’d found a way to make healthy cinnamon buns…cause I LOVE them! We dont have a cinnabon in PE sadly so I way over indulged on my recent visit to CT! lol. Also we dont do meatless MOnday’s but I’m working on implementing that as well. The aim…to lose weight! Putting me on the spot here with a deadline, but let me say 30kgs by the end of November. My food challenge is huge- I still need to loose another 10kg, but I love to cook -so I need to prepare Low GI one pot meals for my family that is healthy and that I can loose weight at the same time. My time is very limited in the evenings therefore I prefer one pot meals. I have set myself a goal of up to end April to loose these kgs. The big thing will be to keep them off. i am always looking for something new to cook, both for the family to enjoy and for me not to get bored making it! i try two or three new recipes a month and have now implemented a meat free day, but am struggling to find things that wont make a four year old cry!! ( and i cant just keep on giving her a mielie each week….) These buns will go down well this weekend, thanks! can i make that a meat -less meal? my mother will have heart failure! My wife and I are expecting our first child in July. I will be looking at healthy alternatives to our usual meals and more one pot meals – I will be doing the cooking and cleaning, so the less dishes the better 🙂 I also want to start experimenting with making our own baby food. I am planning on hosting a dinner party for about 10-15 people in the next few weeks. I know it does not sound like much, but it is definitely the biggest dinner party I have ever had (max was 6 people before) and I have decided to challenge myself and go all out with starter, mains and dinner, and I have set myself the task of not being able to use any recipe I have tried before – so wish me good luck! Hope this is the start to many more dinner parties to come! My challenge for the year is to become more adventurous in my cooking and spend more time cooking for pleasure as opposed to the daily grind! I find that being a working mom, there is not much pleasure in preparing the daily evening meal (also having a 4 year old who is very difficult to please doesn’t help). I plan on having friends around at least once a month to show off my new offerings – starting at the end of Jan! I also want to introduce my boys (11 and 7) to more culinary delights. Have started with some simple dishes and so far so good. I promised myself I would try making pizza dough this year – well I found this recipe that can be used to make vetkoek and it can also be used for pizza, rolls, bread etc. I tried it an it was so easy even a child could do it! Wow am I proud of myself. My cooking challenge is to use more whole grains and pulses. Loved the easy cinnamon rolls. my cooking challenge for this year is to make one thing a month I have never done before. This month I have already made cannelloni so I am off to a good start.